Diamond Select Toys who will be releasing its first series of Ghostbusters Selects (GB Inc Blog Post) later this year is at San Diego Con. 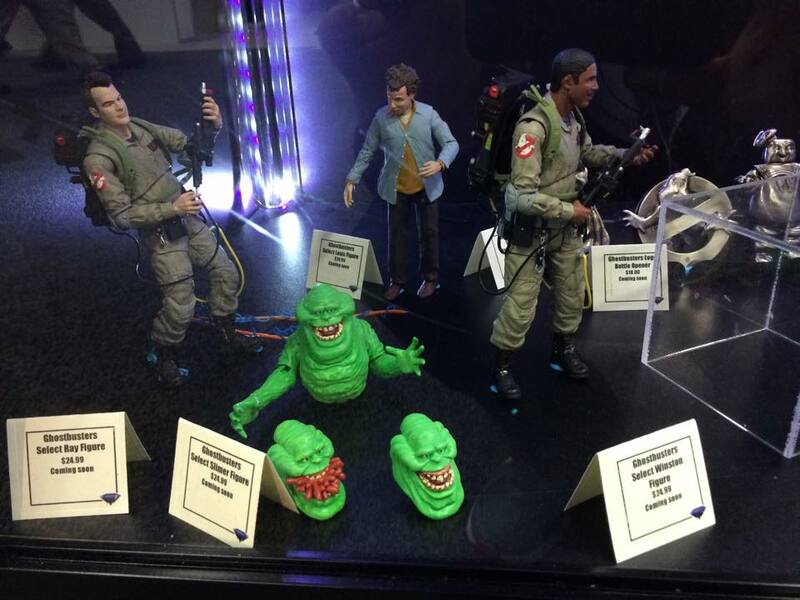 On display naturally are the Winston and Ray Ghostbusters Selects. Along with Louis as Keymaster ‘Ghostbuster’ Select. Originally the third figure was up in the air as figures releases can depend on licensee approval. DST’s own Zach Oats thought the third figure could be Dana as Gatekeeper. New Ghostbusters Selects for series 2 (and beyond) have been produced and are also being shown to SDCC attendees. Thanks to Toy News International for taking and sharing pictures. Let’s check them out! Ladies and gentleman, the visionary behind Ghostbusters, Peter Venkman Ghostbusters Select! For some reason Peter isn’t wearing his khaki web/pistol belt. I can’t quite tell, it looks like the flight suit might have been slimed somewhat as well. Giving you bug eyes since 1984. 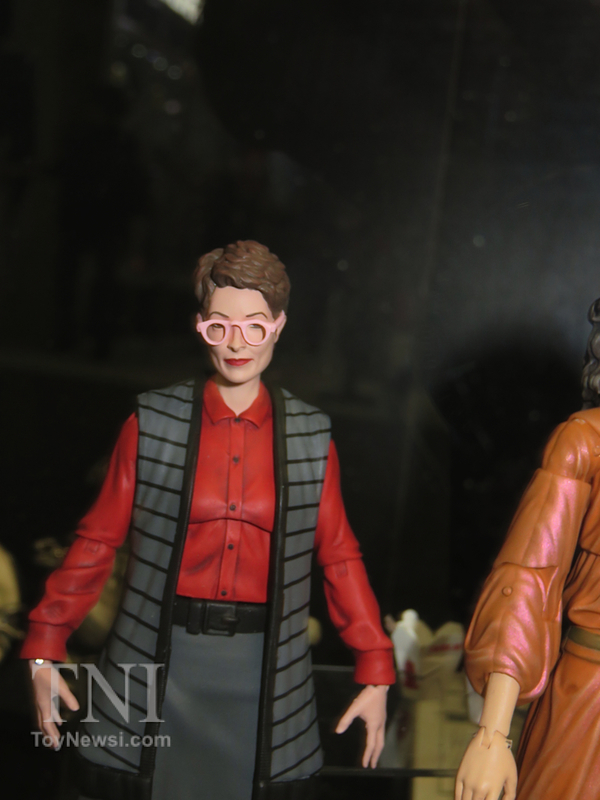 Finally, a Ghostbusters licensee is making a detailed Janine Melnitz figure! I’ve only written about ghostheads having one for oh, 5 years now. At the time I wrote how a company (then Matty Collector) could either make Janine with her original look from Ghostbusters or do her more colorful makeover from Ghostbusters II. Without seeing an actual figure I think I thought ‘GB2 Janine’ would have stood out more. After seeing an actual Janine Melnitz ‘Ghostbuster’ Select figure I’m glad they chose (or had to because of the terms of the license) Janine’s look and style from Ghostbusters. Hopefully when the Ghostbusters Selects do well and if their a Ghostbusters II Selects line fans could still get a Ghostbusters II Janine. You can have it your way ghostheads. As the 12 figures may make up the Shandor Building/Gozer Temple scene from Ghostbusters it was an easy choice for DST to make Terror Dogs. It appears they’ll be making at least one Terror Dog which will come with two sets of horns. If DST doesn’t make a second Terror Dog, their seems to be room for one more figure. 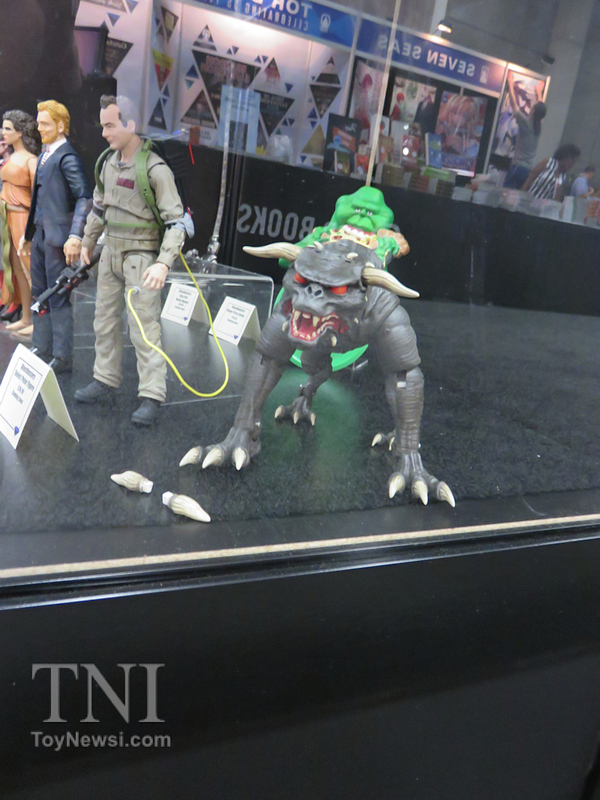 For Ghostbusters 20th anniversary, N.E.C.A made both Terror Dog figures. Unfortunately for the time they didn’t have the “likeness rights” to make the actual Ghostbusters. Three years ago, for San Diego Comic Con Matty Collector decided to make a big deal out of producing and selling a Dana as Gatekeeper figure. i.e. : con exclusive at first and the packaging. Also known as Zuul, Gatekeeper of Gozer (Ecto-Containment First Impression) the figure/statue wasn’t without its faults. In 2012 when Gozer could have returned it was the only mass produced Dana/Gatekeeper figure we had. How are the Ghostbusters going to stop an inter dimensional cross rip if Gozer didn’t put the moves on Ghostbusters Select Peter’s would be girlfriend? 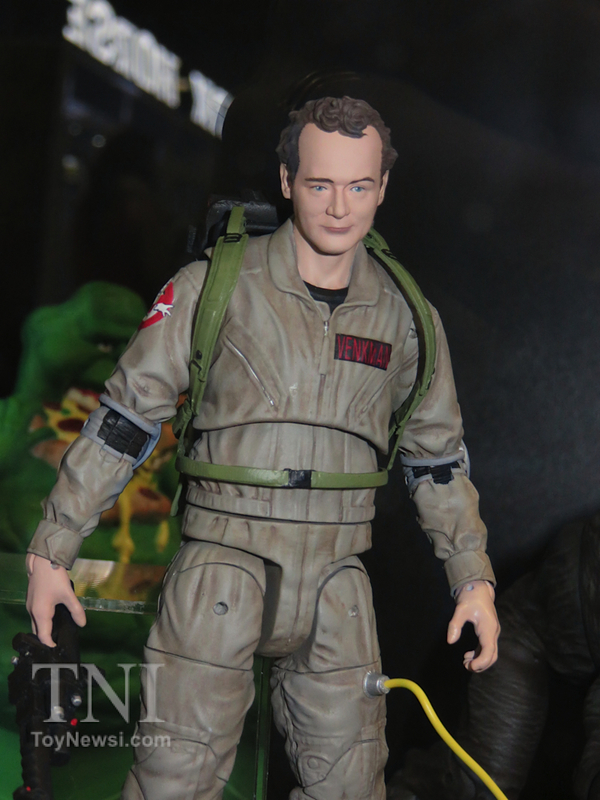 I thought the Gozer action figure was from N.E.C.A. Its from whatever toy company it wants to be. Up until Ghostbusters 20th Anniversary N.E.C.A had made the first and only realistic Gozer action figure. Without N.E.C.A Ghostbusters figures, a Gozer figure could not thrive for a decade +. With at least three Ghostbusters Select figures (hopefully Egon ‘Select’ Spengler) to come, a receptionist who really needs a break, a pecker head bent on shutting the Ghostbusters Selects down, paranormal dog(s) and two people living inside both Louis and Dana, DST raised the stakes with Gozer The Gozerian! 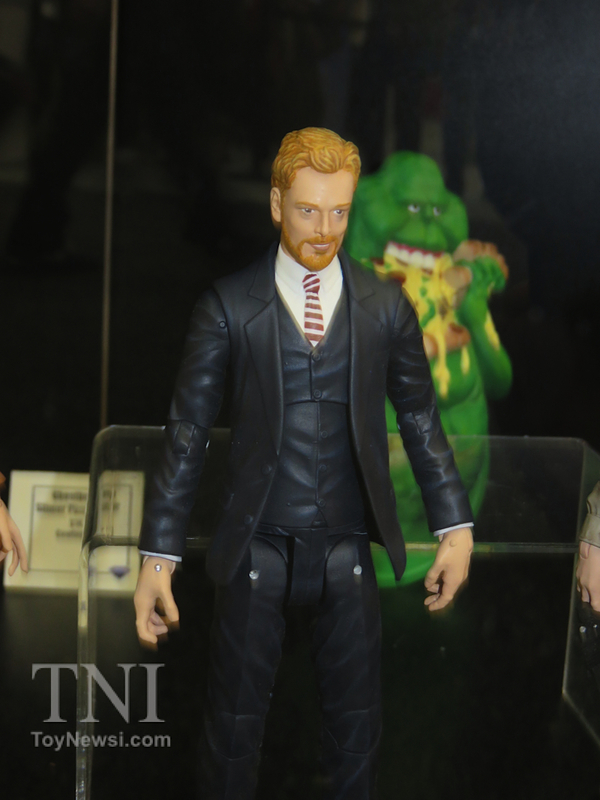 I had heard (yet not had seen) near the end of SDCC that DST also had their ‘Ghostbuster’ Select Slimer on display. Previously Kenner, N.E.C.A and Matty Collector have made various scale versions of The Green Ghost, known pretty much as Slimer. As one of the original 12 Ghostbusters Select figures (he has a really good agent) Slimer who appears to be relatively in scale to its human counter parts should have a removable head (I’m pretty sure a first) which can replaced with one of two additional Slimer heads. One with a different facial expression. The other with a mouth full of NYC street cart hot dogs! Which will probably become a fan favorite. All your bank accounts belong to us. and more neck movement and more authenticity to her features.